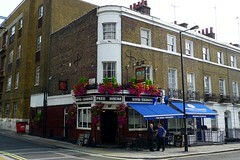 An old-fashioned pub near Paddington Station. Inside, there's a single room, with some small tables and bench seating near the front, and a few more tables up a ramp at the back. It has bare wooden floors, and well-kept though pleasantly untouched by any trendifying refurbishment. There's a small area of seating outside, under awnings. There are two handpulls for ale at the bar, with Brakspear Bitter(£3.60) and Greene King IPA photo of bar. They also have the standard range of draught lagers, including Heineken, Beck's Vier, San Miguel and Sagres, as well as Aspall's cider. It may not seem like much from the outside, but this is a pleasant, friendly place. The extensive selection of champagne on the menu (including Cristal) and empty bottles in the window suggest that at least some moneyed clientele share this opinion. Accessibility: There's a single step to get in, and toilets are down a narrow staircase to the rear of the building. Last edited 2016-06-20 12:47:48 (version 9; diff). List all versions. Page last edited 2016-06-20 12:47:48 (version 9).